"Developing A Payment App? Here Are Some Of The Key Points You Should Consider"
Android and iOS are two of the widely popular and most used mobile operating systems until today. In this write-up, we'll focus on iOS mobile application development mainly taking into consideration the two main programming languages used to develop iOS apps - Objective-C and Swift. Here, we'll do a comparative study on both the programming languages. Let's first look briefly into what is Objective-C. Objective C is a class-based, object-oriented and general-purpose programming language designed by Tom Love and Brad Cox. This was the main programming language that was used by Apple for their iOS and macOS operating systems, and also for Cocoa Touch and Cocoa (their respective Application Programming Interfaces (APIs)) until Swift was introduced. The programming language Swift was designed and developed by Apple Inc. for its macOS, iOS, tvOS, z/OS, watchOS and Linux with the help of Chris Lattner, John McCall, Doug Gregor, Joe Groff and Ted Kremenek. Like Objective-C, this programming language is also object-oriented, general-purpose, multi-paradigm and block structure. 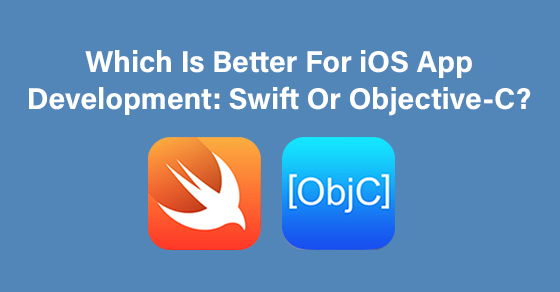 Let us now compare the two programming languages: Swift vs. Objective-C. Programming codes using Swift are cleaner than that of Objective-C. In Swift, the function calls are more organized with a list of parameters that are neatly separated by commas. Also, Swift looks a lot more like the plain English language. Hence, it is simple and easy for developers to read, rather than hunting through the code looking for error-ridden codes. Swift has better clarity in syntax and so, programmers find it more convenience while writing program codes. With Swift, developers can write a complex function in a limited number of lines, which otherwise would have taken several more lines in Objective-C. The programming language, Objective-C is pretty much dependent on C. Hence it will require programmers to maintain two code files in order to boost the efficiency and also to reduce built time. However, Swift is free from all such dependencies. And so, is easy to maintain when comparing to Objective-C.
Security for a mobile application is not just a requirement but is also one of the crucial factors that determine the success of the application. A safe and secure app tends to attract more users. Swift, unlike Objective-C, is free from common mistakes which tend to have a higher possibility to happen in Objective-C. In Swift, during the event of bad code, the compiler alerts the developer. Hence, programmers tend to avoid mistakes while writing iOS apps when they use Swift. Speed is one of the essential factors that help programmers to determine which programming language they should adopt. Now, with the Swift programming language, any complex object could be run 3.9 times faster, faster than even Python. Also, it is way faster than the implementation of the code in Objective-C. With Swift has proven that it has better speed and consistency than any other language used for iOS app development, it makes sense why it is being chosen to be the programmer's pick. As you can see, all the points we discussed above show that Swift is definitely the best choice for programmers for iOS app development. But that does not mean that Swift comes with only advantages over Objective-C. Yes, the programming language has its own disadvantages, it has limited compatibility. This means that programmers have to go through heavy program rewrite to make the app function perfectly with new versions. Now, in conclusion, Swift definitely has many features that surpass Objective-C. But ultimately, when it comes to choosing one among the two programming languages, the final decision will depend on the size of the application, the project's deadline, team strength and the technical awareness of the team as well.